I performed my "American Tea Party Anthem" and "Twenty Ten: We're Gonna Vote Them Out" at CPAC as a representative for TeaPartyExpress.org. I was struck and excited by the high number of youths in attendance (over 50% were under 25 years old). With liberal iron fisted dictatorship regimes ruling most of America's campuses, how did these kids survive attempts to indoctrinate them? Those with whom I chatted said they simply figured it out. Just the other day, a friend's daughter who is a freshman in college complained about being forced to write a flowery essay about how Obama mirrors Martin Luther King. It is a shame this brilliant young lady must choose between publicly standing up for her principles or a passing grade. The youths at CPAC were extremely enthusiastic and upbeat. I suspect many are practicing stealth conservatism at college. It was also exciting to see many fellow black conservatives at CPAC. Interestingly, every black with whom I spoke had an entrepreneurial gleam in their eyes which broadcast, "I'm grateful to be born in America and I am going for it!" I detected no hint of entitlement or victim mindsets in these blacks. They were truly refreshing. 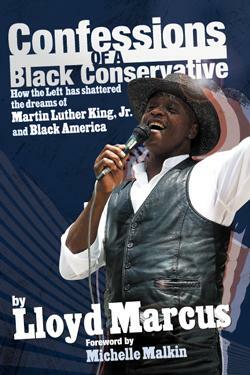 At CPAC, I debuted my book, "Confessions of a Black Conservative: How the Left has shattered the dreams of Martin Luther King, Jr. and Black America." I pray it will contribute to opening the eyes of my fellow blacks who have been deceived for so many years. Most impressive at CPAC was the upbeat, excited and empowered atmosphere. With Scott Brown's miracle win in Massachusetts and stopping the government's takeover of health care under our belts, We The People were feeling good and strutting our stuff. This was a dramatic contrast to the mood of CPAC last year. Obama had the house, the senate, and the American people under his spell. His agenda appeared unstoppable. Like the song, "What a Difference a Day Makes," what a huge difference a year made. To stop the wicked King Obama, We The People took to the streets with modern day pitchforks known as home-made magic marker signs. We facebooked, twittered, blogged and tweeted when needed. Across America we tea partied hardy. Amazingly, we put the progressives on the run. Celebrating our power at CPAC so much was fun. The Tea Party Movement was the star of CPAC winning the prestigious annual Ronald Reagan award. This was the first time it was awarded to a movement rather than an individual. Thus, We The People were the stars of CPAC. A number of CPAC attendees expressed concern that the Tea Party Movement might be hijacked by a political party. I do not believe this is possible. We The People are too savvy for that to happen. We will dance with any politician who embraces our agenda of fiscal responsibility, smaller government and national security. Be warned, we will hold their feet to the fire. Yes, we may be deceived by an occasional liberal in conservative clothing. Such characterless politicians will suffer the consequences of their betrayal at the polls. Despite the Tea Party Movement's incredible victorious defensive goal line stop of Obama's agenda, some on our side still choose to be negative. They whine that both political parties are irreparably corrupt, it is all about money and power and nothing will change that. These people ridicule me for "wasting my time" traveling on the Tea Party Express tours and trying to make a difference. These sad sacks view our situation so hopelessly I almost feel it is my civic duty to refer them to their local suicide hot-line. To my dear gloom and doomers, I offer a famous quote, "the only thing needed for evil to prosper is for good men to do nothing". As acknowledged at CPAC, We The People via the Tea Party Movement are a powerful force for positive change in America. Just as nothing in life, the Tea Party Movement is not perfect. But, it is one heck of a great start. At CPAC, I saw an army of young, brilliant and enthusiastic conservatives waiting in the wings for their opportunities to fight. I met proud grateful black Americans who did not drink the Obama Kool Aid eagerly pursuing their dreams. Our conservative future, as the song says, "looks so bright we have to wear shades". So let us bask in our successes and continue to make the weak links strong. Together, we can do this. Together and with a smile from God, we will restore America!